I installed Antergos last week, picking gnome as my DE. After installing, I installed the nvidia drivers and ran updates. I think the lock screen worked initially on install, but after the updates my lock screen is white and I can’t log back in. I am running LightDM, the default that comes with the installer. A few possible relevant details: The white screen was super low res. After adjusting the default Grub resolution, the lock screen followed that updated resolution. 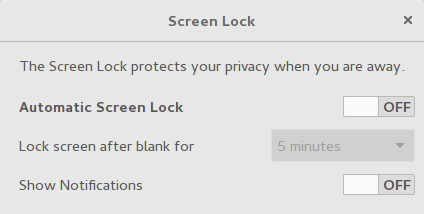 just a thought : have you set the lock screen parameters with the Light Lock Setting application and deactivated any standard Gnome features like black screen in Privacy and Power modules of Gnome settings ? No I have not. Is that the default lock screen in antergos? Does it not play nice with some gnome features? deactivated any standard Gnome features like black screen in Privacy and Power modules of Gnome settings ? Come to think of it, I might have switched on the Screen lock in the gnome settings while trouble shooting/screwing around. Comparing the settings in gnome settings and light locker settings, they look fairly redundant. Could I have possibly turned on a second locking mechanism? If so, any idea where I can look to reconcile this? ** (light-locker:2236): WARNING **: Couldn't register with accessibility bus: Did not receive a reply. Possible causes include: the remote application did not send a reply, the message bus security policy blocked the reply, the reply timeout expired, or the network connection was broken. By experience, if you use Light DM, it is better not to use the Gnome features. 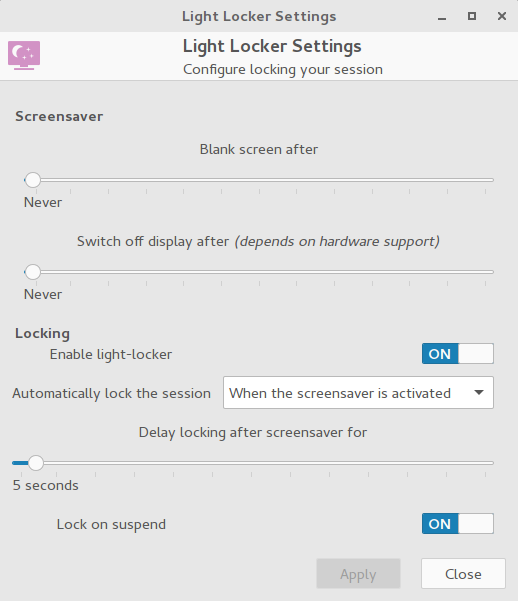 Not sure it will solve your issue but it is worth trying to set the parameters you want with Light Lock Setting (default lock screen with Light DM as far as I know) and to remove any Gnome lock screen features in Privacy and Power modules. okay, it is exactly what I meant. So, what is the result now ? Does it work ? If not,then, it might be connected to your driver update. In that case, the only advice I can give you is to provide us with your hardware specifications and to search the Arch wiki and forum as well, focusing on your video card. Sorry, wasn’t clear. Yeah even after setting these things back, it still just goes white when I lock the screen. Is it a matter of uninstalling the nvidia drivers to roll back? Or do I also need to re-install some older driver? I am not in the video card thing but if you think it was working before, it is worth reverting the process by uninstalling the suspected driver. 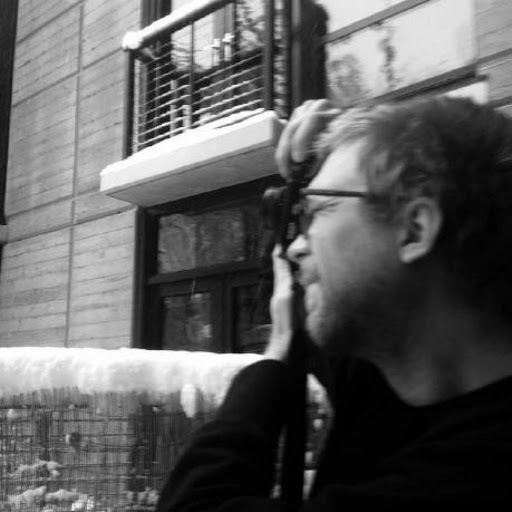 If it works again, we will know where to look at ! What you could do is to run and report the output of the command lspci -k | grep -A 4 -E "(VGA|3D)" before uninstalling and after. It will give us information on your video card setup. And that seems to be working fine for now. It would be rad to get Light-DM working later though. bcomnes ~ $ lspci -k | grep -A 4 -E "(VGA|3D)"
@bcomnes Good to remember indeed that switching to GDM is the fix currently. Myself, I am now on KDE and I use light DM without any issue with the lock screen. I remember though that I switched to GDM when I was on Gnome. Let us hope a solution will be found as @lots-0-logs said. I can confirm I was having the same issue with Gnome 3.16 using an nvidia video card and proprietary nvidia drivers. I moved to gdm and it addressed my issue as well. $ lspci -k | grep -A 4 -E "(VGA|3D)"
@bcomnes and @lots.0.logs, thank you for the help!